C.V., Richmond, Va., January 29, 1909. Regiment, Armistead's Brigade, Pickett's Division. It was my wish that this address should be made by Col. Rawley W. Martin, of Lynchburg, who led the Fifty-third Virginia in Pickett's Charge, and fell by the side of Armistead on Cemetery Ridge. But this could not be, and so I come to take his place. For the task assigned me I feel myself but poorly equipped. Unlike Col. Martin, I followed our old Commander, as St. Peter followed the Master, "afar off." It is, I may say, with unfeigned diffidence that I venture to speak of war to the veteran soldiers who are here to-night. On me, however, through your kindness, is this honor conferred, that I should present to the Camp the portrait of Lewis A. Armistead. I thank you for it with all my heart. The Armistead family, coming direct from England, settled in Virginia in 1636, and became ere long a family of soldiers. Five brothers, three of them in the regular army, took part in the war of 1812. Col. George Armistead, the oldest of the five, defended Fort McHenry. The flag which waved over it during the bombardment, which Key immortalized as the "Star Spangled Banner," was long guarded as a sacred heir-loom by his descendants. It is now laid up in the National Museum. A second brother, Lewis Gustavus Adolphus, named for the Swedish hero, "The Lion of the North," fell at Fort Erie. Walker Keith Armistead, the father of our old chief, graduated at West Point in 1803, fought in Canada, closed the Seminole war, and was, when he died in 1845, second in command in the regular army. Miss Stanley, who became his wife, was a native of the Old North State, and so it happened that Lewis A. Armistead was born at Newbern, N.C., in 1817. As a matter of course, the young Lewis entered West Point in 1836. Here, however, his career was cut short. He became involved in a personal conflict with Jubal A. Early, who had insulted him on the parade ground, and cracking the worthy's head with a mess-hall plate, as the story runs, was retired from West Point; but in 1839 entered the regular army as lieutenant in the Sixth Regiment of Infantry, and fought against the Seminoles under Zachary Taylor and under his own father. During the war with Mexico he did splendid service. He led the storming party at Chapultepec, and was brevetted Captain and then Major for gallantry displayed at Contreras, and Cherubusco, and Molino Del Ray. That war being ended, he served for fourteen years on the frontier, and in 1859 marched against the hostile Indians and defeated them. On the secession of Virginia he promptly resigned his command in the old army, tramped on foot across the plains to Austin, Texas, came straight to Richmond, and in April, 1861, was made Colonel of the Fifty-seventh Virginia, and twelve months afterwards, in April, 1862, was commissioned Brigadier-General. In that capacity he fought at Seven Pines, at Malvern Hill, at Second Manassas, at Sharpsburg, displaying everywhere conspicuous gallantry, and winning by his coolness under fire, by his stern perseverance and his indomitable pluck, the applause of his superiors and the entire confidence of his men. During the first Maryland campaign he was made Provost Marshal of the army, and received the personal thanks of General Lee for the ability with which he discharged the duties of that office. In September, 1862, his brigade, which comprised the Fifty-seventh, Fifty-third, the Fourteenth, the Ninth and the Thirty-eighth Virginia, was incorporated with Pickett's Division. General Armistead was no "holiday soldier," no "carpet-knight." "He was," says Col. Martin, "a strict disciplinarian, but never a martinet. Obedience to duty he regarded as the first qualification of a soldier. For straggling on the march on neglect of duty on the part of his men, he held the officer in immediate command strictly responsible. The private must answer to the officer, but the officer to him." Thus far we have followed his career. Born of noble stock, a Virginian to his heart's core, linked by ties of blood with many of our best, the son of a soldier, familiar from childhood with tales of war, trained at West Point, tested by years of service in Florida, in Texas, in Mexico, in Virginia, obedient to duty, demanding in turn obedience from others, resolute, unyielding, with courage tempered in the flame of battle, he waited for a fit opportunity to prove himself the hero he was, to write his name high on the roll of fame and win the plaudits of the world. That opportunity came at Gettysburg. Of the charge made by Pettigrew and Pickett on Cemetery Ridge, I do not propose to speak at length. On the controversies which have raged around it, I shall not touch. But in order to appreciate the heroism of Armistead we must picture in few words the part played by Pickett's Division. During the artillery duel which preceded the charge we lay quiet and (some of us) hugged the ground. When the cannonade subsided we fell in at the word of command and moved in line of battle over the wooded ridge in front, past our artillery, and down the slope to the edge of the woods. Here, for the first time, we caught sight of the field of battle. A thousand yards away lay Cemetery Ridge, curving around to the left to Culp's Hill, and off to our right stood Round-Top and little Round-Top, crowned with artillery. Beyond that ridge and on its crest lay eighty thousand men, every breastwork finished, every reserve posted, every gun in position, awaiting our assault. Between us and Cemetery Ridge was a field as open as this floor, not a tree, not a stone to shelter one man from the storm of battle. The scene which met the eyes of Armistead's men as we descended the slope was splendid. Before us, one hundred and fifty yards away, moving on like waves of the sea, marched Garnett and Kemper, their battle-flags flashing in the sunlight. The regiments of Armistead, marching in perfect order, with disciplined tread, followed where they led. Soon the heavy guns on Round-Top were trained upon us, and howling shells burst around us or crashed through our ranks. The further we advanced the more tremendous was the cannonade. Our own artillery on the heights behind thundered over our heads at the enemy's guns on Cemetery Ridge. And so we marched "vaulted with fire." As we crossed the plain beyond the Cordori house, we halted at the word of command, moved by the left flank, till opposite the point we aimed to strike, then in line of battle, the guns on Cemetery Ridge blazing in our faces, and every regiment of Armistead's brigade dressed on its colors as straight as the line of yonder door. The gallant men who met our onset thrilled with emotions of fear and admiration--they tell it themselves--at the "grandeur" of the scene, at the "magnificence" of our advance. To the Count de Paris, as he watched the Confederate column bearing down all opposition, buffeting with unshaken courage the fierce volleys that met it, "it seemed," he says, "to be driven by an irresistible force." Meanwhile the fire of the enemy grew every more violent, ever more destructive. The cannon on Round-Top "volleyed and thundered." From Cemetery Ridge grapeshot and canister tore through our ranks. We marched, says Longstreet, "through a fearful fire from the batteries in front and from Round-Top." "The slaughter," he says, "was terrible, the enfilade fire from batteries on Round-Top very destructive." But worse remained behind. From the stone wall which sheltered their ranks the hostile infantry "poured down," as Longstreet says, "a terrific fire." The hiss of bullets was incessant. Men fell at every step; they fell, I thought, like grass before the scythe. Such were the scenes which some of us witnessed that day. The severity of our loss attests how deadly were the perils through which we passed. Of three Brigadiers, two were buried on the field, and one left weltering in his blood. Of the fifteen men who led the regiments of Pickett not one escaped. Seven were disabled, some with ghastly wounds, and eight of them were slain outright. Of all the field officers in the whole division only two remained unhurt. "It was a miracle," says the Count de Paris, "to see them safe and sound." And now, bearing these things firmly in mind, let us follow Armistead. "A short time," says Col. Martin, "before the advance was ordered, the General, as his custom was, marched up and down in front of his troops, encouraging them in every way," for the shock of arms so soon to follow. "Remember, men, what you are fighting for. Remember your homes and your firesides, your mothers and wives and sisters and your sweethearts." When the signal guns fired, he promptly called "attention," and instantly every man was on his feet. Coming then right to the front of the Fifty-third Virginia, which was that day the battalion of direction, he said to Color-Sergeant Blackburn; "Sergeant, are you going to plant those colors on the enemy's works over yonder?" "Yes, General," was the firm reply, "if mortal man can do it, I will." Then the chief exhorted his men to follow their colors and to remember the brave words of Sergeant Blackburn, and giving the command, "Battalion, forward; guide-centre, march," he placed himself in front of the Fifty-third Virginia, and, marching on foot, twenty yards ahead of his brigade, watched and directed our advance. It was not long before the battle was raging in all its fury. The brigades of Garnett and Kemper were in our front, and as we drew near the advance lines Kemper rode back to Armistead, who marched on foot, and said: "Armistead, hurry up; I am going to charge those heights and carry them, and I want you to support me." "I'll do it," he replied. Then, glorying in the conduct of his men, he said to Kemper: "Look at my line; it never looked better on dress parade." And now came the supreme test. He quietly gave the order, "Colonel, double-quick." And putting his black felt hat on the point of his sword, he led the advance, all the time in front of his line of battle, marching straight ahead through a hail of bullets, "the very embodiment of a heroic commander." The sword pierced through the hat, and more than once it slipped down to the hilt, and we saw above it the naked steel. As often as the hat slipped down the old hero would hoist it again to the sword's point. And so, born aloft with matchless courage, it caught the eye, it nerved the hearts of his devoted men, a standard as glorious, as worthy to be sung, as the plume that floated at Ivry above the helmet of Navarre. And now the battle raged with redoubled fury. "As we got within forty yards of the stone wall," says Lieutenant Whitehead, "came all along the line the order of charge, and charge we did. From behind the fence the Yankee infantry rose and poured into our ranks a murderous fire. Garnett's brigade and Kemper's had almost entirely disappeared; their brave commanders, their gallant officers, with hundred of the rank and file, were stretched on the field, and it remained for Armistead's men to finish the work. After a desperate fight the Yankees began to give way; and as they fell back our men rushed forward to the stone wall with unfaltering steps, Armistead still leading the charge." The advance line halted here, but only for an instant. The veteran Armistead took in with the eye of a trained soldier the whole situation, and saw in a flash that to halt there meant ruin and defeat. Just ahead, bristling with cannon, was Cemetery Ridge. Just beyond it Hancock, "a foeman worthy of his steel," was hurrying up his heavy reserves. On the right and on the left the enemy's lines were still intact. On both flanks fierce assaults would soon be made on Pickett's men. 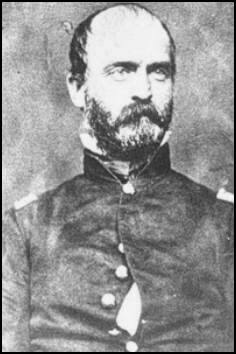 "Colonel," said Armistead to the commanding officer of the Fifty-third, "we cannot stay here." A word to Martin was enough. "Forward with the colors," he cried, and over the wall they went, Armistead and Martin; and with them went a gallant band resolved that day to conquer or die. The flag of the Fifty-third regiment, borne by Lieutenant Carter, flashed like a meteor in the van. The indomitable Armistead, his hat on the point of his sword, towered before them like a pillar of fire. "Follow me, boys; give them the cold steel." A hundred and fifty undaunted men followed their chief. They left behind them the stone wall. They passed the earth works. They seized the cannon that, double shotted at ten yards distance, had torn our ranks with cannister. Victory seemed within their grasp. But alas! the support they looked for never came. In the nick of time Hancock's reserves were hurried to the front. They came on, he says, "four lines deep," and firing at close range, poured into the little band that followed Armistead a destructive volley. In that "hell of fire," as Bilharz says, "nothing could live." The intrepid Martin fell maimed for life. Forty-two of his brave Virginians lay dead around him. And there, in the Bloody Angle, our heroic chief, grasping a captured cannon to turn it on the foe, fell amongst his devoted men, pierced with mortal wounds, and sealing with his heart's blood the high-water mark of the Confederate cause. As they bore him to the rear they met the gallant Hancock hurrying to the front. * [*A different account of this is given in Junkin's "Life of Hancock," page 117. I followed Colonel Martin.] Each recognized the other. They had been comrades in the old army. And learning who he was, Hancock dismounted, and grasping Armistead's hand, told him with a soldier's sympathy, how sorry he was to see him wounded, and promised to send mementoes and messages to his loved ones in Virginia, and tried to cheer him with the hope that his wounds would not be mortal, as our hero said. But Armistead was right. He knew that death was near at hand. Carried from the field a prisoner, he lingered through the 4th of July and died on the 5th, "leaving," says Martin, "an example of patriotic ardor, of heroism and devotion to duty which ought to be handed down through the ages." When his kinsmen heard of his glorious death they came and took his body, took all that was mortal of him, down to Baltimore, and with reverent hands laid him to rest amongst his own people, in the church-yard of old St. Paul's, the hero of Gettysburg besides the hero of Fort McHenry. A granite obelisk marks the spot where he fell on Cemetery Ridge. The sword which dropped from his dying grasp you may see it now in the Confederate Museum. Such, comrades, was the soldier whose portrait we unveil tonight. As I stand before you my thoughts leap back over the forty-five years that lie between, back to the day when I saw him leading his brigade through the storm of shot and shell on the field of Gettysburg. "None died on that field with greater glory than he, though many died, and there was much glory." Yes, comrades, we know how many died whose names we hold in deathless honor--Edmonds and Owens, and Patton, and Williams, and Allen, and Stewart, and Hodges, and Magruder, and the knightly Garnett. The heart of Virginia was wrung with anguish. Her stately head was bowed in grief. The flower of her chivalry fell in that fatal charge. But none fell so lamented as Armistead, none crowned the glory like his. Many others had done valiantly, but he surpassed them all. He did a deed that was matchless, unique, without a parallel on that field, when, leading his men with unflinching courage through the storm of fire, he pierced the enemy's line and fell there in the Bloody Angle. Not Wolfe at Quebec, not Ney at Waterloo, every exhibited a greater example of heroism and devotion than that displayed by our lamented chief. The fame of his heroic deeds has spread through all the world. In every history they stand recorded. A generous foe unites with us to honor his memory. The stolid Longstreet kindles with enthusiasm to tell how "the noble Armistead fell on Cemetery Ridge by the wheels of the enemy's cannon." And so, comrades, we present you now the portrait of a soldier, "without fear and withour reproach," of one who, tried with fiery trials, was always equal to the test; who, true as steel to his convictions, upheld on every field the honor of Virginia, and added yet another leaf to the chaplet of glory which shall forever encircle her queenly head. He comes to take his place in this "Hall of Fame" with the heroes of our heroic age, who leaped to arms forty-eight years ago, at the call of Virginia, and followed even unto death that starry cross which was to them the very symbol of duty and of self-sacrifice. He comes to take his rightful place with Ashby and Pelham and Jackson, with Stuart and Pegram and A. P. Hill. They welcome him, this noble band, they hail him as a kindred spirit, as a comrade true. Our peerless Lee, we may well believe, looks with approval on this scene. Long may that portrait hang upon these walls. May it show to all the word what men they were who followed once the banner of Lee. And if ever again the youth of Virginia are called to contend on the field of battle for her honor and her rights, may one glance at that noble face nerve their hearts with unflinching determination to do or die in her defence. Hail then, unconquered chief, "Dead" once, like Latour d'Auvergne, "on the field of honor." We welcome thee to thy predestined place, "numbered now among the immortals." The Maps of Gettysburg offers thirty "action-sections" comprising the entire campaign. These include the march to and from the battlefield, and virtually every significant event in between. Gottfried's original maps further enrich each "action-section." Keyed to each piece of cartography is detailed text that includes hundreds of soldiers' quotes that make the Gettysburg story come alive. This presentation allows readers to easily and quickly find a map and text on virtually any portion of the campaign, from the great cavalry clash at Brandy Station on June 9, to the last Confederate withdrawal of troops across the Potomac River on July 15, 1863. Serious students of the battle will appreciate the extensive and authoritative endnotes. They will also want to bring the book along on their trips to the battlefield… Perfect for the easy chair or for stomping the hallowed ground of Gettysburg, The Maps of Gettysburg promises to be a seminal work that belongs on the bookshelf of every serious and casual student of the battle. This particular book follows the Armistead family name through history and makes the perfect gift for your family members and anyone interested in the Armistead name. In the book you'll find out about where people with the Armistead last name originated. You may discover the countries and ports they left behind, the ships they sailed and more. You'll get a better idea of where people sharing the Armistead name settled and where they may reside today in the United States, Canada, England and other countries. You'll get all this information and much more in your Armistead family name book. If your last name is not Armistead, then check out our collection of nearly 300,000 family name books to find other available names in the series by entering the name in the search box provided below.